Mary Louise Charters, 60, of Essexville, left, receives a shoulder massage from June V. Eastman, 53, or Midland who receives a massage from New York City social worker Hedda Matza-Haughton during a "Laugh for the Health of It" session at the Doubletree Hotel in Bay City. Laughter is a healing, cathartic release, says social worker Hedda Matza-Haughton. Under her alias "Princess Juicy Joy," this consultant of fun leads workshops and individual coaching sessions using laughter and play to reduce stress and improve health. She was part of Bay Regional Medical Center's recent "What Cancer Can't Do: The Mind/Body Connection" conference in Bay City and got cancer patients and caregivers to feel good in the face of pain and fear. "Cancer patients will wonder 'What do I have to laugh about?' You can't laugh all the time in illness, but you can be in control of your outlook," she said. 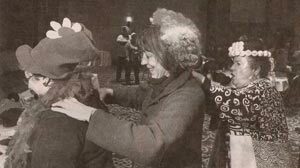 After she was diagnosed with breast cancer in 1989, the social worker wore clown noses to her doctor appointments, she said. "It broke the ice, and they saw me as a person." As the princess, Matza-Haughton wears a crown of smiley-face balls. She comes armed with all kinds of silly props, hats, masks and toys, and encourages people to use them in skits and introductions of their own alter egos. "They start feeling the physical effects of laughing and then I support it with research," she said. "The shortest distance between two people is laughter." With her Manhattan-based For the Health of It Consulting Services, Matza-Haughton tells clients to remember what they did when they were younger, close their eyes and experience it. Make lists of what makes you laugh. "When people in an oncologist's waiting room start watching Lucille Ball clips instead of a heavy film about cancer, they start talking to each other and communicate better with the doctor," she said. She keeps comedy tapes in her car for commutes and cartoons on her desk. "If you had no responsibilities and could do anything for a day, what would you love to do? Add some of that to every day," she said. "Nurture your joy. You can make small changes." As a specialist in the field of psychoneuroimmunology, Matza-Haughton believes the mind influences the body. Studies show that patients who are taught meditation, for example, can live longer that those taking the same medications without that relaxation technique. These practices and ideas are complementary to traditional medicine, not alternatives, she said, adding, "We need to look at the mind, the body, the whole person." Oncology services at Bay Regional Medical Center include support groups, pet therapy, relaxation tapes and a lot of humor, said Sandy Garzell, oncology program manager. "In my experience, those patients who have a good attitude and laugh a lot are able to deal with crises a lot better," she said. There are simple ways to get laughing every day, Matza-Haughton said. Go on a date with a 4-year-old; at that age, they laugh frequently. Get a laugh buddy you can call when you feel stressed. She also likes to take friends to a restaurant with some funny props. As soon as the main course is served, they pull out their hats or teddy bears. "Pretty soon," she said, "people at other tables are inviting us over and everyone is interacting." Copyright, 2005, The Saginaw News. All Rights Reserved. Used by NewsBank with Permission.